The Oly Mountain Boys | Pacific Northwest Bluegrass | Blog : Support us on Kickstarter! The time has come, folks - the Oly Mountain Boys NEED YOU to help us make a great new bluegrass concept album! We set out with this album to create something uniquely Oly Mountain Boys. We were inspired by the way the pioneers of bluegrass wrote songs rooted in the place they were from. We created Charlie McCarver, a fictional character who lived in early 20th century Washington, to help us tell a story about Washington through bluegrass. We're putting the finishing touches on the mixes of the 18 tracks that make up the album - you can check out THREE PREVIEW TRACKS on our website. It'll be a concept album with supplemental contributions from writers and artists - those contributions are starting to come in now, and we're excited by what we see. But because it's such a new and different way of making an album, we need support to get it across the finish line. 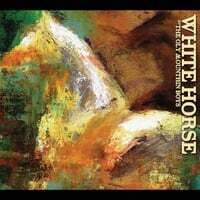 Through our Kickstarter campaign you can support the making of White Horse at a variety of pledge levels with great rewards. Maybe you just want to make sure you get your hands on a copy. Or maybe you want a new-look Oly Mountain Boys t-shirt (available in mens' or ladies cut!). Or maybe you want to get us up close and personal at your house for a house party! Check out the options, and we'll be grateful for your support at any level. We're excited by the potential for this project and thrilled at the support we've been feeling for it from our fans. We're kicking off our Kickstarter campaign with a trip to California, and we're looking forward to watching the contributions roll in as we roll south! Come see us there, or when we get back! WEDNESDAY, FEBRUARY 12th, 9pm - Caldera Tap House, Ashland OR. THURSDAY, FEBRUARY 13th, 9pm - Lucky Horseshoe, San Francisco CA, with Windy Hill. Some of our favorite bluegrassers and great friends hosting us at one of their favorite San Fran spots! SATURDAY, FEBRUARY 15th, 6:30pm - Castoro Cellars, Templeton CA. A benefit to support RISE! Special opening guest Scott Gates! SUNDAY, FEBRUARY 16th, 5pm - Veteran's Memorial Fundraiser, Morro Bay CA. SUNDAY, FEBRUARY 16th, 8pm - The Frog and Peach, San Luis Obispo CA. FRIDAY, FEBRUARY 21st, 5-8pm - JBLM Brewfest, Joint Base Lewis-McChord, WA.